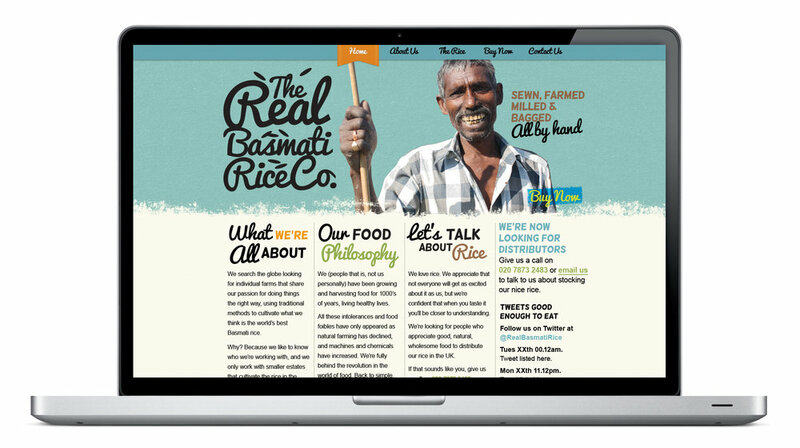 From the fertile rivers of Punjab in Pakistan, the birthplace of the family behind the brand, to an idea that sprang from South London, The Real Basmati Rice Co. was created. Priding themselves on centuries-old processes of growing and cultivating their Basmati rice by hand, TRBRCo. sought to introduce their unique product to the UK as a gourmet food for genuine connoisseurs. Their rice is stored for up to 18 months to create a unique taste and aroma, and to ensure the grains do not stick together. We at One Agency created a brand story that highlighted these powerful attributes. The values were echoed in the branding, using a strong graphic aesthetic coupled with simple production processes, in essence echoing the rice cultivation process. Brown coated bags were used for the 500g and 1kg bags with a conscious decision not to opt for the larger bags that more well known but lower quality Basmati rice producers and resellers were using. This approach reflected the ethos of a gourmet rice. One Agency created an ethos of simple, ethical and natural food that now is now the red thread that runs through all their communications. We created the brand logo, photography, website and packaging to reflect the hand made and natural approach to their products. With annual UK sales up 5.3% to £504.9m* it was our aim to cut through the plethora of basmati offerings to really enforce the taste and handmade nature of the product. Our narrative and brand story helped win distribution deals with Amazon, Harrods Food Hall and Whole Foods Market. One Agency have developed the brand story for TRBRCo. that has been presented to various buyers in Europe and the US. A recent contract has been to supply the famous Harrod's Food Hall in Knightsbridge. The unique process of growing and cultivation was highlighted in the website we created for TRBCo. Recent articles about TRBRCo as featured in the Guardian.